The sectional semifinals for Massachusetts high school football are upon us, which means it is time to dish out some picks for this week’s games, specifically Massachusetts Interscholastic Athletic Association (MIAA) D5 games. Contests for this weekend begin tomorrow, Friday, November 3rd – make sure to stay connected on social media, specifically Twitter (@MattNoonan11) or (@NoontimeSports) for scores, updates and news. (5) Newburyport at (1) Lynnfield | Friday, Nov. 3rd, 7 p.m.
(6) Watertown at (2) Somerville | Friday, Nov. 3rd, 7 p.m.
(5) Foxboro at (1) Dennis-Yarmouth | Nov. 3rd, 6 p.m.
(3) Scituate at (2) Medfield |Nov. 3rd, 6:30 p.m.
(4) Northbridge vs. (1) Nipmuc | Nov. 4th, 2:30 p.m.
(3) Auburn at (2) Oakmont | Nov. 3rd, 7 p.m.
(4) Amherst at (1) West Springfield | Nov. 3rd, 7 p.m.
(3) East Longmeadow at (2) Longmeadow | Nov. 3rd, 7 p.m. Team USA continued their exciting run on Wednesday with an impressive 3-1 win against France! Good Thursday to everyone and welcome into the one and only Daily Noontime! You’re excited, right? Absolutely you’re excited, (insert laughing sound effect). Any who, here’s the day’s headlines and news, so enjoy! * Team USA defeated France in the FIFA World Cup semi-finals on Wednesday and will now take on Japan in the finals. However, some believe that this particular national team puts on a show that can’t be missed. * It’s official, NFL quarterbacks Tom Brady, Drew Brees and Peyton Manning want a new CBA, as well as the owners to cooperate. * Boston Celtics point guard Rajon Rondo has been enjoying the NBA Lockout. OK that’s definitely an understatement, bur really, he’s in the news due to his elbow. * Now that the Milwaukee Brewers have Francisco Rodriguez on their roster, one has to imagine that they’re interested in making a playoff run, right? * The New England Revolution appeared to be no match for Manchester United, who beat them Wednesday evening at Gillette Stadium, 4-1. * Apparently the NCAA has turned their attention to the University of Auburn as of recently and wants to find out more in regards to Cam Newton‘s recruitment. How awesome is this shot? Good day to everyone and welcome to the Daily Noontime for Wednesday May 11, 2011. How’s everyone doing? Well, while you answer that question, enjoy today’s headlines, news and much more! * The Carolina Panthers selected Cam Newton as their first overall draft pick, but now an Auburn coach has some things to say about the gunslinger. 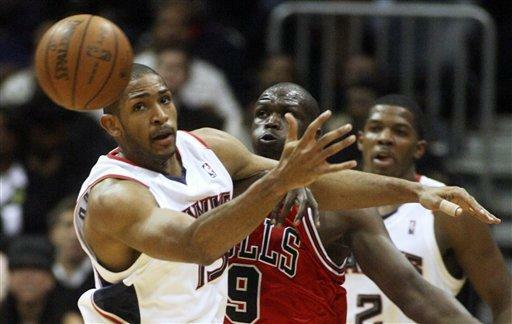 * Game 5 between the Chicago Bulls and Atlanta Hawks was played on Tuesday. The series was tied, 2-2, but once the buzzer sounded, the Bulls escaped with an important 95-83 victory. * According to sources, NBA commissioner David Stern and league executive director Billy Hunter have met face-to-face in regards to negotiating a new CBA-contract. * It’s been a few days since the Los Angles Lakers were eliminated, but now the question remains, what will happen to the team next season? * Apparently the Houston Astros are in the process of selling their team to a businessman named Jim Crane. * Los Angles Lakers forward/center Andrew Bynum will officially be suspended for five games next season due fouling J.J. Barea in Game 4 of the Western Conference semi-finals. This is something you rarely see in the NBA, a player following their own shot, securing a rebound and attempting a second shot! Could Jeff Green really help the Boston Celtics? Good Friday morning to everyone and welcome into yet another Daily Noontime and of course, a brand new weekend! Have a great day, be safe and here are your headlines, news and video of the day! * The NBA Trade Deadline has come and gone, but one of the biggest trades involved the Boston Celtics and Oklahoma City Thunder. * How about the Chicago Bulls? “Da Bulls” defeated the Miami Heat on Thursday in an impressive win. * The Georgetown Hoyas will continue the remainder of their regular season without one of their young stars, Chris Wright. * According to the NFL mediator, “some progress” has been made between both the players union and owners. * The NFL combine turned into a variety of question and answers on Thursday and certainly, many NFL team officials wanted to talk with former Auburn University quarterback, Cam Newton. * Miami Heat forward Chris Bosh believes that Chicago Bulls guard Derrick Rose is going to be the leagues MVP. * Good news for Detroit Tigers fans, first baseman Miguel Cabrera has officially shown up to spring training camp after being arrested a week ago for a DUI. Alright, it is indeed Friday and welcome to another weekend in 2011! Today, we have an awesome Daily Noontime, except, all of them are amazing and cool. Anyways, here is the Daily Noontime for Friday February 18, 2011, have a fantastic weekend everyone! * Give some props to Chicago Bulls guard Derrick Rose, who scored a career high 42-points and helped his team beat the San Antonio Spurs, 109-99. * Sadly, according to reports, Indiana Pacers former guard Reggie Miller was not declared a finalist for the NBA Hall of Fame class of 2011. * The NFL is two weeks away from a potential lockout, but Thursday’s news it seems that the players union has agreed to a mediation. * It seems that Texas Rangers new pitcher Brandon Webb wants to be a starter in the rotation once April comes, but will that happen? * The Detroit Tigers shouldn’t be too pleased by Miguel Cabrera‘s recent actions, as the slugger was arrested for a DUI. Get excited for the NBA All-Star weekend and Blake Griffin‘s dunks. Proudly powered by WordPress Theme: Dynamic News.